Chinese snooker Jin Long plays against Sam Baird during the wild card round of 2012 World Snooker Haikou Open in Haikou, South China’s Hainan province, Feb 27, 2012. Chinese snooker Jin Long shrugged off a strong comeback from his English opponent Sam Baird to win 5-3 during the wild card round of 2012 World Snooker Haikou Open on Monday, setting up a first round clash against Ding Junhui on Tuesday. Jin enjoyed a flying start and built up a quick 3-0 lead in the best-of-nine-frame match against Baird, while the 23-year-old Baird woke up to claim the fourth frame 76-23 before the end of the first session. In the second session Baird won another two frames to narrow the gap to 3-4. But in the eighth frame, which featured quite a lot of misplays from both side, Baird squandered a 56-32 lead and made a deadly mistake as he failed to score the yellow ball, leaving Jin to rally back and seal the victory. 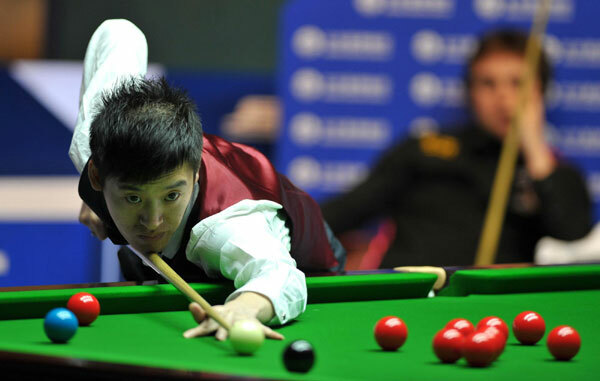 During another match, Chinese rookie Wu Haotian lost to English snooker Tom Ford 4-5. And the lucky Ford will directly advance to the second round as his opponent Ronald Antonio O’Sullivan quitted the tournament for health reasons.